Does your beautifully-landscaped home fade from view when the sun sets? If your only yard illumination is twinkling lights at the holidays, and a sconce beside your front entry the rest of the year, it may be time to consult an experienced landscape lighting professional to help you shed some light on that gorgeous exterior all year round. 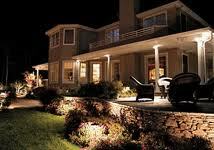 Landscape lighting can serve many functions. A patio that’s a great place to gather for lunch could turn into a late-night party spot with the right lighting. Note the patio in this photo – a sunny spot to relax during the day becomes an outdoor room to enjoy at night when the right lighting is incorporated. Or perhaps you’ve got some spectacular flowers or trees you’d like to put the spotlight on so they’re in view even after dark. Even unique masonry or stone features benefit from strategically-placed lighting. Landscape lighting can do so much more than illuminate walkways for safety; the right lights in the right place can transform your home’s exterior and its surrounding areas into inviting outdoor spots. Here are some PHOTOS to give you ideas, along with some basic information on the different types of lighting available. There are a wide variety of types and styles available, so if you’re somewhat overwhelmed by your choices, you may want to consult a landscape designer who specializes in landscape lighting to make sure you get the intended effect. Architectural Landscape Design is a licensed Minnesota outdoor lighting contractor, and since we’re also landscape designers, we can help you select lighting that will not only illuminate your home at night but transform your entire yard whent the sun goes down.